About three years ago my mom brought me a young sapling from her garden in Toronto. She assured me it was an acacia tree – one that flowers exquisitely. I was excited for an ornamental tree (our lot is treeless), and I planted it in the front, in order to fulfill my homeowner’s fantasy of looking out my bedroom window to leaves and a lofty canopy. After two years, when the tree had hit almost ten feet tall my mom basically straight up told me it was not an acacia tree. 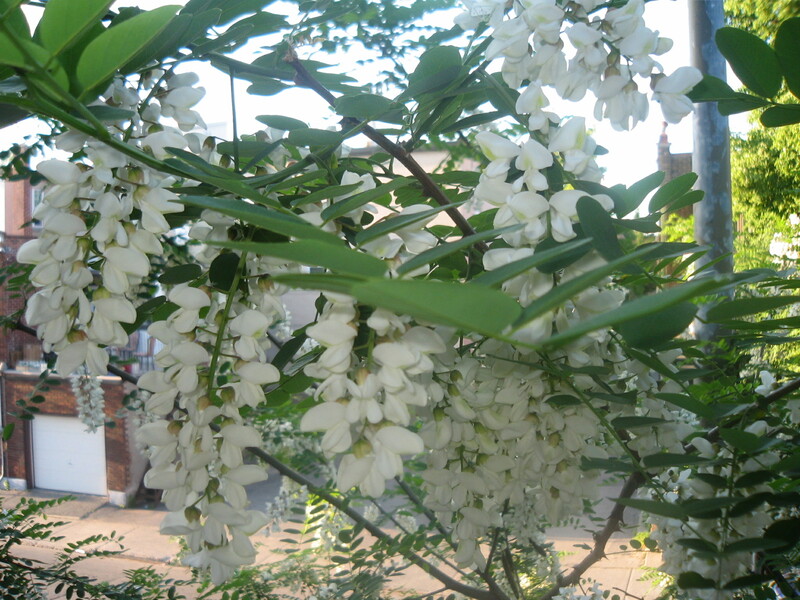 Betrayed by its thorny branches, the tree was identified as a common weed: the black locust. Cool name, but a weed? What constitutes the distinction? Something that just grows where we don’t want it to, that can’t be contained (also known as invasive)? Except for the fact that my black locust’s roots are choking out my peonies, astilbe and irises, I don’t feel like the tree is weedy at all. Good news: The tree is totally covered in these delicate, cascading blossoms. And they fill the air leading up to our front steps with a sweet aroma that I totally dig. I feel like the success of this plant validates my role as a gardener. Bad news: I’ve just learned from Wikipedia that the robinia pseudoacacia is totally toxic if ingested, from branch to leaf to seed pod to root (except for the flowers). Keep your horses away, or risk them experiencing depression! Note the Latin name confirms this plant is an acacia fake-out. My mom did tell me to rip it out last year, but I don’t have the heart. It’s too pretty. Besides, bees love this thing, and those little guys need all the help they can get. What a beautiful weed 🙂 It’s great you are doing your bit to keep the busy bees happy. Weeds, even toxic but beautiful ones, have a place on earth. This weed is stunning in flower! Aboslutely glorious! Good things come disguised sometimes. Great for the bees! If the black locust is BAD for deers why is there one in front of THE DEARS” house? I have a newfound affection for black locust trees after moving to a house where they figure prominently on the property. It takes them a while to come into their own, but when they do, your patience is well rewarded. In two weeks or so the trees will be covered in blossoms and bees.